Paget’s disease of the bone is a long term condition that causes excessive growth of bone which causes them to both thicken and weaken. Commonly affected sites include the skull, spine, pelvis and the long bones of the upper arms and legs. Paget’s disease is uncommonly diagnosed in people aged below 40 years. At 40, the incidence is ~3%. At 80 years of age, this rises to 10% with men being more commonly affected than women. There is a skin condition called Paget’s Disease which is completely unrelated to this bone condition and why this disorder is always termed ‘Paget’s Disease of Bone’. Why Paget’s disease develops in some people and not others is not yet fully understood. It may be a genetic predisposition that gets ‘turned on’ by an unidentified virus.While the cause of Paget’s disease remains unknown, risk factors seem to include age, race and genetic factors. Those with Anglo-Celtic heritage are more likely to develop Paget’s disease of Bone, particularly when living in Britain, Australia and Germany. The incidence increases with age and there is a family connection in around 1/3 of cases diagnosed. Healthy bone tissue is maintained by cells called osteoblasts(that build new bone) and osteoclasts (that remove old bone). In Paget’s disease, the osteoblasts become overactive and produce too much bone. The bone isn’t organised in the usual way and is weak. While almost 95% of those diagnosed have no symptoms, this can lead to joint instability, an enlarged bony area that intrudes onto surrounding tissues and the potential for fractures. The condition develops slowly and the symptoms may do the same. They may also seem to come on very quickly, for example in a fracture or pressure on a nerve where the condition had not previously produced any symptoms at all. * Inner ear conditions such as tinnitus (ringing in the ears) and vertigo. * Increased workload on the heart due to the increased number of blood vessels in the affected bones. 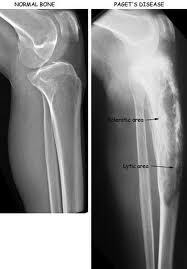 * Bone cancer of the affected area can occur rarely. As the majority of Paget’s disease sufferers have no symptoms, the diagnosis is often made when investigating another problem. The diagnosis can be confirmed via a blood test showing elevated alkaline phosphatase. * Drugs to slow the progression of the disorder. * Non-steroidal anti-inflammatory drugs for pain. in the blood is often present in Paget’s disease. Excessive calcium in the blood can cause other complications, particularly with the heart. * Surgery may be needed to relieve a compressed nerve, stabilise a fracture with a plate or replace a badly worn joint. * Exercise will help to maintain bone strength and mobility and strength in the surrounding muscles. High impact sports may be inappropriate for you so check with your doctor first.